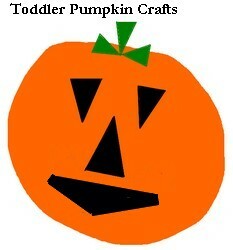 Here’s a simple Halloween art project that you can do with your preschool children or the kindergarten crowd. truction paper. Cut stem shapes and leaf shapes from the green paper. If your children are old enough to use safety scissors, encourage them to cut their own shapes. Sit with the children and show them how the different shapes can be used to make different faces on the pumpkins. Hand over the glue sticks and let your kids make you some bright Halloween decorations for your fridge or windows.